Broadway Babies is a camp for ages 3*-6. This camp runs in 1 week long sessions from June 24-Aug 2nd. Camp is a half day from 9:30am-12:30pm. 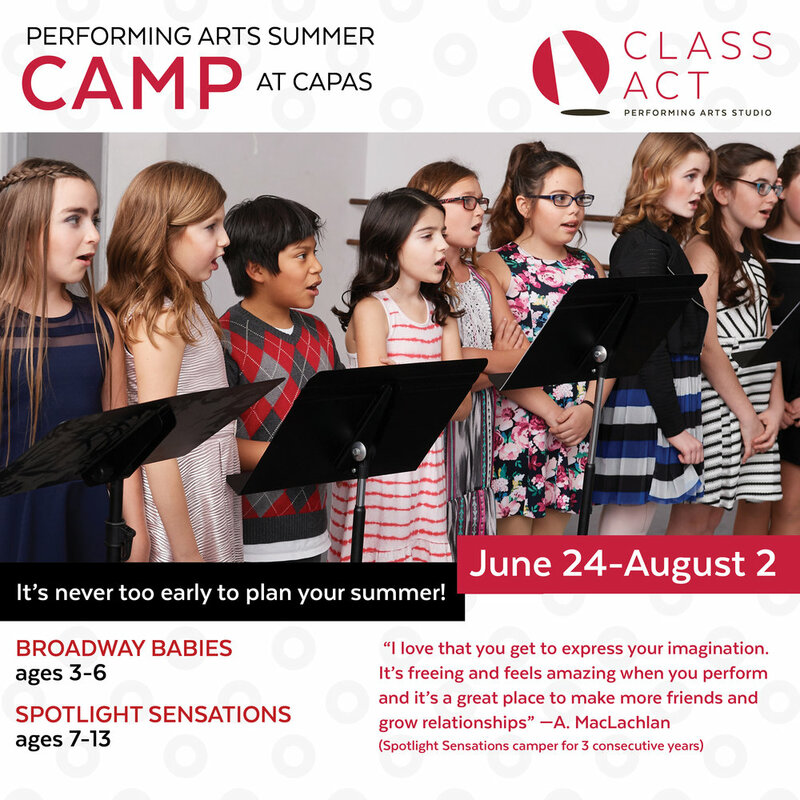 Students will learn the fundamentals of singing acting and dancing and put on a performance on the last day of camp (each Friday for the last 15mins of camp). Students may register for as many sessions as they like. Week 2 July 1-July 5th American Idol- Sing your heart out to pop hits from Trolls and Sing! There will be a one time Summer Camp registration fee of $20. A $100 deposit is due upon registration. Remaining balances will be charged 1 week prior to camp start date. We do not offer early drop-off or late pick-up for camps. LUNCH and SNACKS will NOT be provided by Class Act. Please bring your own snacks and lunch. No classes July 4th. Prices for sessions that include this date have been adjusted. Spotlight Sensations is a camp for ages 7-13 which runs in 2 week sessions from June 24th- Aug 2nd. This is a full day camp from 9:30am-4pm. Students will work together to present a 30 minute musical revue with singing, dancing, and dialogue. A matinee and an evening performance will be held on the second Thursday of each 2 week session (Performance will be held on Wednesday, July 3rd for Session 1). Students may register for as many sessions as they like. Session 1 June 24th-July 5th The British Are Coming! From the Beatles to Elton John, a celebration of England’s rock idols that forever changed the music scene and American musical theater! Session 2 July 8th-July 19th Disney Dreamin Explore some of your favorite Disney movies with a twist...because anything can happen when you wish upon a star! Session 3 July 22nd - Aug 2nd Jukebox Jams - Go back in time and rock out to some of your favorite tunes of yesteryear including sock hop hits, disco fever, and 80s rock! Improv! Acting Techniques! Acting for the Camera! Commercials & Film! Audition Techniques! Keep your performance skills sharp this summer and train with us! Students with gain comprehensive acting training with our professional staff who have worked in all aspects of the acting world. 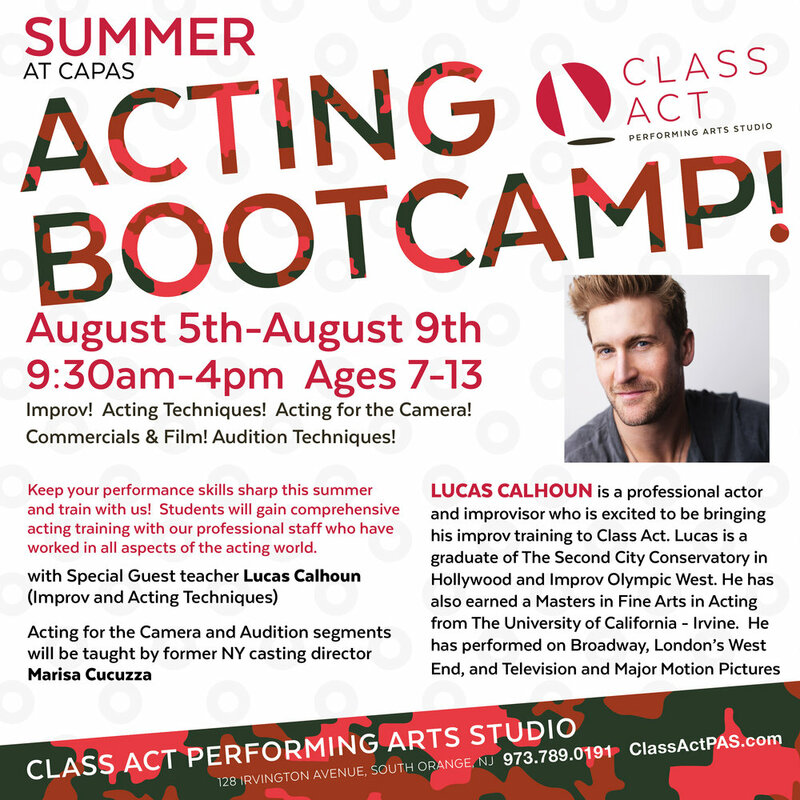 9:30am-12:30pm Improv and Acting Techniques with Special Guest teacher Lucas Calhoun!